From Bear Market to Sector Rotation – It’s All a Bit Confusing Now! This year has been a roller coaster for global equity investors. From the weak start to the year to the recovery in early March it has left investors with more questions than answers. Are we in a bear market? Are we just pausing until global growth resumes? Lots of questions and few answers, but maybe we can distill some useful information from the recent price action of global equity markets. In a world where the headlines revolve around broad market indices such as the S&P 500 or the Nikkei 225 much is left unexplored. What we find is great investor indecision – over 40% of stocks in our global sample reside in the Improving Stage. 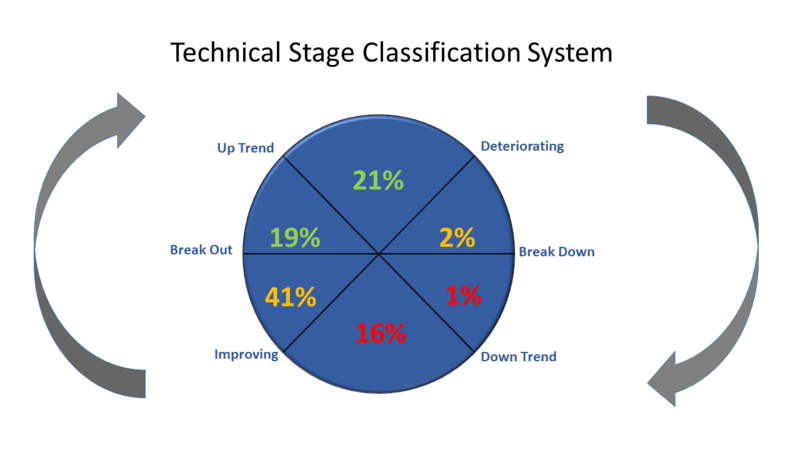 While historically one would expect these stocks to keep on moving up higher to the Break Out Stage there is also a non-trivial probability of regressing to the Down Turn Stage hence our characterization of the Improving Stage as indecisive. We also find a strong rotation away from sectors and equity styles that out-performed last year toward much maligned resource-oriented sectors and countries. Is the current technical picture more consistent with a Bear Market or an ongoing strong sector rotation toward out-of-favor sectors? Will the recovery in resource- oriented sectors last? Click here to download the report:Strong Sector Rotation or a Bear Market? 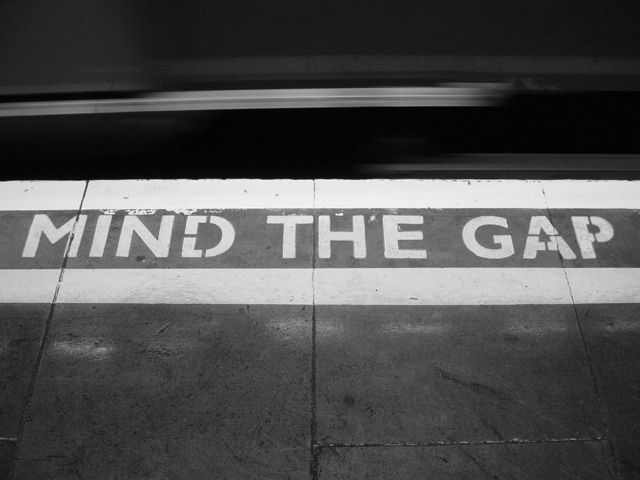 Many years ago when my family and I took a trip to London my children took great delight in hearing the loud warning of “mind the gap” when taking the Tube. To this day we still joke about it and hearing the expression always brings back a flash of fond memories. But what I had in mind for this note was a different type of gap. Specifically, the gap that is developing between developed equity markets and emerging market stocks. Going into 2016 sentiment was pretty bearish on emerging market equities. Institutional investors were having a hard time hanging on to allocations that significantly under-performed expectations and retail investors had long been fleeing the asset class. Moreover, over the prior ten years (2015-2006) emerging markets had only out-performed international developed markets by an annualized 0.45%. Clearly not enough once transaction costs and the usually higher management fees are taken into account. Never mind the higher volatility of the asset class. So what had happened to the emerging markets story? Investors once justifying their EM allocations on the growth of the middle class in these markets (the shift from export-driven to domestic consumption growth) had reverted back to explaining the disappointing performance of EM equities as a function of the collapse in global commodity prices. At the end of 2015 it was hard to find investors willingly delinking expectations for EM equities from those of global commodity markets. Both asset classes ranked at or near the bottom of the pile in terms of 2016 prospects. Not that every investors was bearish but you had to be a true contrarian to in the face of public ridicule increase allocations to EM or commodities. The short EM/Commodity trade had become very crowded indeed! The rise and subsequent bursting of the TMT bubble of the late 90’s. Every portfolio manager back in those days felt the pressure to increase their exposure to companies in these sectors despite a lack of sound fundamentals and exorbitant valuations. The real estate finance smorgasbord of builders, mortgage issuers, insurers and credit re-packagers of the 2004-2007 period. The finance sector as a whole was gorging on low interest rates in the context of a low volatility capital market environment. The end result was not unpredictable but in its day there was comfort in numbers and the possibility of something seriously going wrong was summarily dismissed by the vast horde of investors then making money on the trade. The funny thing about crowded trades is that before they burst few people are willing to take a count of the players at the party. Sometimes people will fail to even acknowledge that a party is taking place. Tunnel vision sets in and investors are subsequently surprised when a turn of events has party attendees suddenly sprinting for the exits. Is the short EM equities trade finally nearing exhaustion? It sure feels like it. Systematic ways of looking at the “numbers” will invariably lag price behavior. Our own allocation models have been pointing to a closing of the gap between expectations for developed and emerging market forward returns but we still slightly prefer the former. Let’s take a look at major asset class performance in 2016. 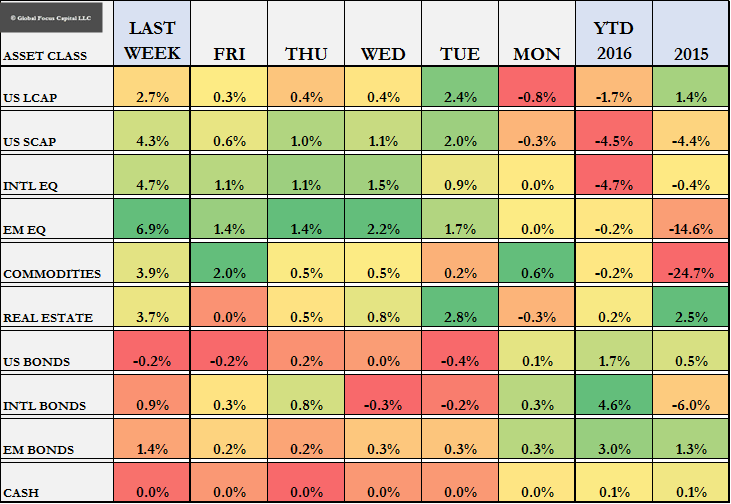 Last week EM equities were up 3.3% – best of the major asset class categories. For the year, EM equities are up 4.4% -best among all equity sub-asset classes. The gap between emerging and developed international market (EAFE) performance is widening. Year to date the gap stands at over 7%. The MSCI EAFE index is down 2.68% for the year while the MSCI ACWI-x US index (which has an EM weight close to 20%) is down approximately 0.4%. The performance gap between developed international and emerging market equities is already causing some anxiety among international equity managers. Managers tied to the broader ACWI index are clearly having to swim upstream given their likely beginning of year under-weight to EM stocks. Last year the consensus underweight to EM equities paid off handsomely. EAFE out-performed EM equities by a whopping 14%. An under-weight to EM equities could have hidden a lot of sins elsewhere in the portfolio but this year the tide has turned. Having been a money manager for over 20 years I know the feeling when a previously ignored/disliked segment of the markets suddenly changes course and gaps up. Ignoring the problem and remaining steadfast in the belief that the portfolio is correctly positioned. The likely outcome of the “no action” manager is binary – at the end of the year the manager will either be a hero or a goat. Can This Russian Bear Learn To Samba? 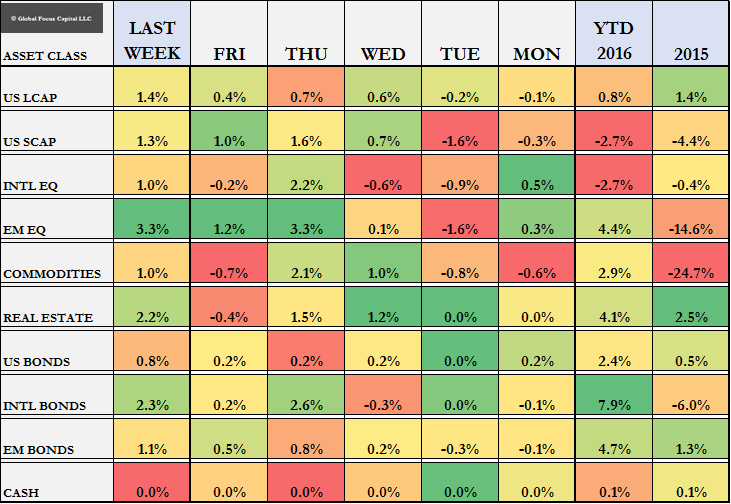 Last week we wrote about the amazing year to date performance of the Brazilian equity market. Despite all the awful headlines and negative investor sentiment the Brazilian market was up over 20% and last week it went up a further 4%. A similarly widely disliked equity market fraught with negative headlines having a great start to the year is Russia. Russian equities were up 2.5% last week and in 2016 they are up about 11%. Not bad for a market that like Brazil comes with lots and lots of baggage. All resource-oriented equity markets have benefited from the resurgence of commodities and both economies are expected to contract further in 2016, but Russia and Brazil are not cut from the same cloth. 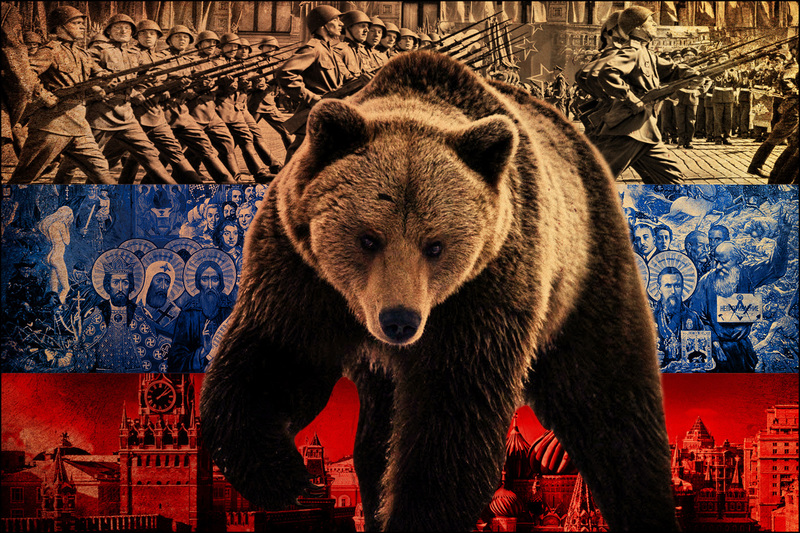 Click to read the full report Can This Russian Bear Learn To Samba? 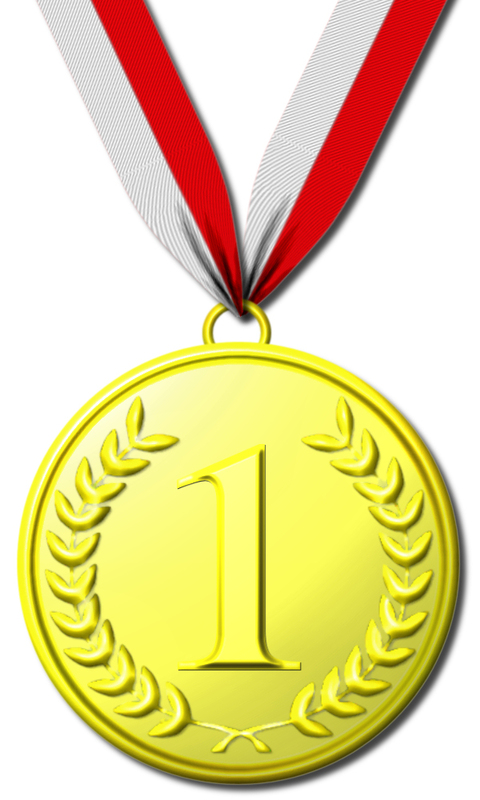 Surprise – The First Gold Medal Goes to Brazil! With all the bad news coming out of Brazil investors must be perplexed by the strength of the Brazilian equity market this year. After a strong jump up last week in both equity prices and the Real, the MSCI Brazil index is up 20% for 2016. The news last week was not good. It was reported that GDP growth clocked in at -3.8% with little hope for a rebound this year. The Zika virus keeps wreaking havoc on the local population, Olympic Game preparations are over-budget and behind schedule, and lastly Ex-President Lula De Silva was detained in a corruption scandal involving the country’s largest company Petrobras. Capital markets are unforgiving to those foolhardy enough to believe that short-term predictions can be made with any accuracy and the example of Brazil hammers home the point. Just when you think that certain investments are basket cases with no hope things turn around. A great example of this happened last week in global capital markets. Now, I am not all that confident that Brazil is out of the woods yet and in fact our country allocation model rates Brazilian equities toward the bottom of the pack. The point is that capital markets are always full of surprises. When do we get the biggest surprises? Usually when the consensus view is at an extreme. After the walloping that commodities and emerging market investments have been taking in the last few years, it is not too surprising to find investor sentiment heavily skewed against these beaten up sectors.